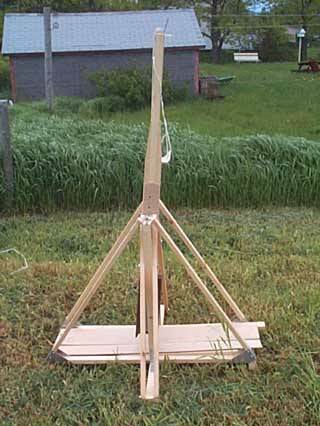 My son, who is involved with the SCA household of The Crew of the Roisin Dubh, said that they were tossing around the idea of using a siege engine, and I immediately thought of a trebuchet. 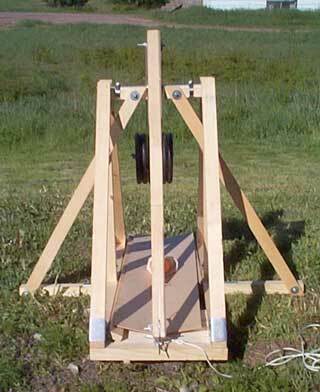 Never mind that a trebuchet would be an unlikely weapon for use on board a ship (a ballista would be more practical), once I started researching trebuchets I got hooked. I knew that the local Boy Scout troop had built one, and it worked fairly well. See this special article from the Sackville Tribune-Post: Sackville Scouts Build Medieval Weapon. Well, you could get a set of plans, and build it exactly as instructed, but that's not as much fun as coming up with your own plans, even if they're based on existing ones. You can tailor your design to fit your situation, as far as available materials and tools go. 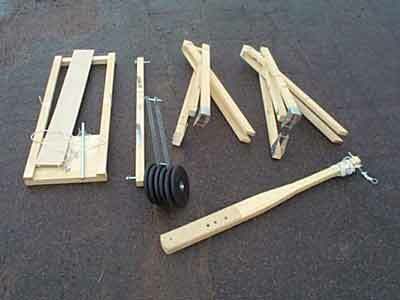 Since your trebuchet may be unique, you will have to go through the process of design, construction, testing, and modifying it. Solve one problem, and another may pop up. That's why I'm calling this page "The Hotspur Chronicles" - it may never be completely finish, only continously improved. 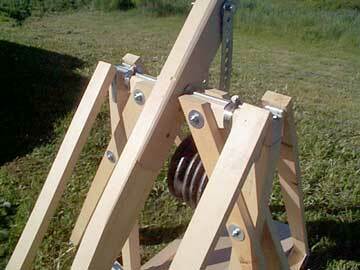 I decided to build a scale model first, just to get the hang of tuning and operating a trebuchet. I wanted to build one that could be knocked down and carried in the trunk of a car. I measured mine (a '92 Pontiac Tempest) and determined that as long as the longest component was no more than 1 meter long, it would fit easily, even between the wheel wells. The name "Hotspur" came from the belligerent character Henry "Hotspur" Percy, in Shakespeare's "Henry IV Part 1". The release pin at the tip of the throwing arm also resembles a spur. When I was doing some computer simulations with Donald Siano's MacTreb I found it convenient to use 104 cm for a total beam length - 100 cm from tip to counterweight axle, plus 4 cm more beyond the counterweight end. It just made it easier to do the mental arithmetic. I used metric measurements because it's easier for calculating lengths and masses. The hardest part was determining whether to design first and shop for materials, or to determine which materials I had readily available and tailor the design to fit them. I ended up going back and forth between the drawing board and the hardware stores over several days, gradually converging on a design and composing a shopping list. I decided on using finished pine, nominally 1"x2" and 2"x2" (actually 20x40 mm, and 36x36 mm). The less expensive and slightly denser spruce that I could find was not clear and straight enough. The pine, on the other hand, would have knots at intervals. I had to come up with a complete list of lengths of the wooden parts, and go into the warehouse with a tape measure to pick out pieces with long enough clear lengths, and check them off the list. That took the good part of an hour by itself. I still had no idea as to what I'd end up using for a counterweight. I got around that by using metal straps for hangers, with factory-made holes every inch. I figured that I could adjust the hangers according to whatever I found. (time passes) Yay! - I was digging around in the basement of the house I had bought last winter, and found two pieces of steel railway rail. One was about 8 cm long, and another piece of heavier gauge rail was about 30 cm. The longer one (shown here) is about 9 or 10 kg. They already had holes through the thin upright part of the rail. When I was building it, I left the horizontal axle support cross beam (nominally 2"x"2", actually 36x36 mm) in one piece, until the outriggers, A-frames, and axle posts were cut and assembled. I cut a groove for the axle to sit in along the top by running it several times over the blade of a table saw, with the blade barely clearing the top of the table. I cut the centre section (thickness of beam plus 2 cm clearance) out of the cross beam at the last moment. The outrigger angle supports pass on either side of the vertical axle support posts. Bolting them towards the middle of the cross beam provides support for the axle while permitting a payload of up to 30 cm wide to pass through below. 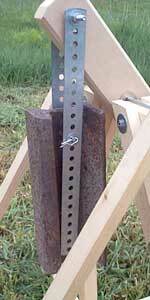 This feature was inspired by a photo of a much larger trebuchet, posted by Ron Toms to the Catapult Message Board. (See Ron's post.) What it does not prevent is horizontal bending, which is what did happen when I was using a 360:1 CW/payload mass ratio. I solved that by increasing the axle diameter from 5/16" to 1/2". Of course this meant drilling out the axle holes in the beam again. The pipe clamps are good enough to keep the axle from shifting around, and they make it easy to dismantle for transport, or for changing to different arm ratios. In this photo, it's set for a 5:1 arm ratio. The strap hinges at the tops of the angled A-frame braces allow the braces to be folded in towards the vertical axle support post, when stowing it away. Initial field trials of trebuchet "Hotspur" went as well as could be expected. I was getting about 20-23 meters with a tennis ball. The trough is two pieces of masonite, simply taped together for a hinge, and either side is elevated by two scrap pieces of 1x2. Eventually I'll glue a strip of rubber or canvas between them like a piano hinge, and cut out some wedge-shaped supports. I left the sling a bit long (until I figure out the optimum length), with excess rope ends tucked up with a series of half-hitches, just to keep them from tangling. I've shortened the release pin since this photo was taken. The pin started out life as a pegboard hook. The main beam axle holes are intentionally off-centre, so that when it is cocked (with the throwing arm tip to the left, in this photo) the majority of the beam is above the axle, for strength. Here I've assembled it for a 5:1 beam ratio. More good fortune. 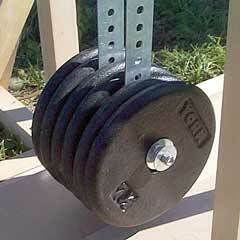 I found set of barbells for Cdn$10.00 at a yard sale, with six 7.5 pound weights (total of approximately 20.5 kg) - more than I'll ever need for a trebuchet of this size. Here they are with all six of them on the CW hangers - two on the left, two in the middle, and two on the right. My idea for using these straps for hangers seems to be working out. With this configuration I was able to drop a tennis ball onto the driveway or the patch of grass next to this side of the concrete steps at the top of the photo. That distance worked out to about 29-32 meters. I measured it very scientifically, counting the paces to the first bounce and multiplying that number by 0.88. I had to keep shortening the sling length (to about 80% of the throwing arm length) and straightening out the release pin (to about 10 degrees?) because it was spiking the ball into the tall grass about 10-20 meters out. A camcorder would have been handy for analyzing the release, but I suspect that the high CW/payload ratio (about 360:1) was causing the throwing arm to rotate to the ideal release angle too quickly for the sling to whip around to the angle where it will slip off the release pin. Shortening the sling would be like a figure skater pulling their arms in close to their body during a spin. Here is a rough guideline for HCW machines. Multiply the beam ratio by twenty. Divide your counter weight by the result and that will give a good starting point for your missle weight. By that reckoning, I should be throwing payloads about 200 g.
I just made a new pouch. The old version had ropes passing through a casing sewn into either side of the pouch, allowing for easy adjustment of sling lengths. Unfortunately that design would allow too much curvature, especially for small heavy payloads like rocks, some of which would not be released at all. This pouch used less canvas. The dark blue stuff is bias tape sewn on to keep the raw edges from fraying. The D-rings are heavy gauge copper wire with the hidden ends overlapped and soldered. I chose a thinner nylon cord for a sling. The payload shown here is an official road hockey ball. They have a bit more mass than a tennis ball (tennis balls are 57 g. and these hockey balls are 66 g), but are water-proof and smooth. They don't bounce as much as tennis balls do, either. 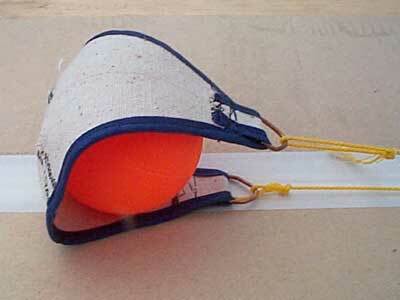 I was getting about 35-40 meters with the hockey ball and the new pouch. - July 22, 2002 - I've created a new page just for construction details on the old and new pouch designs. Hotspur dismantled and ready for travel in the trunk of a car. The two axle supports (upper right) can be made more compact by taking out the bolt that passes through the outrigger braces and vertical axle posts, but this state was good enough when nothing else was in the trunk. More to come as I tweak the design. I've aquired two old hockey stick (yard sale again, 50 cents for the pair) and now I plan to make a lighter beam out of one of them. I'll use the 5/16" axle and reduce the counterweight to 14 kg or less. I also have to improve the trigger mechanism to align it with the fixed ring on the throwing arm tip better, and to make it easier to insert the trigger pin without allowing it to be so loose that it would accidently fall out if the arm is jogged. 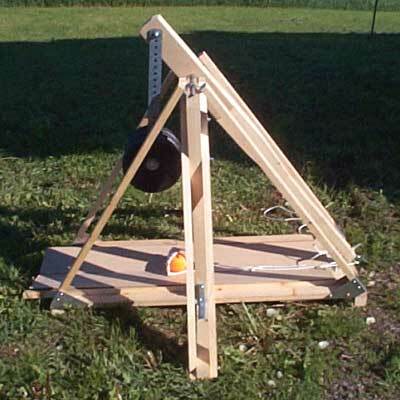 Ripcord's Trebuchet stuff - Ripcord's "Tennis Ball Trebuchet" is a direct ancestor of Hotspur. Ron Toms' Trebuchet.com, particularly the Catapults Message Board, frequented by helpful hurlers who have "been there, done that". Donald Siano has made a trebuchet simulator (Macintosh and Windoze versions), available for download from The Algorithmic Beauty of the Trebuchet. This simulator is great for seeing what effect changing various parameters has on the results. Jump up to my medieval index. My other obsession is old radios - see John Rose's Vintage Radio Home.